The Carboniferous Period of the Paleozoic Era began 354 million years ago. It lasted for about 64 million years, until 290 million years ago. The name “Carboniferous” came from the large amounts of carbon-bearing coal that was formed during the period. The large land masses of Euramerica and Gondwana continued to move toward one another and collide during the Carboniferous Period. Collisions meant some of the land uplifted into mountains. These mountains had no plants covering them. During rainy seasons huge amounts of surface rock was washed into flood plains and deltas. Eurameica and Gondwana were working to form the large supercontinent Pangea that would be important during the next period of the Paleozoic Era. In the early part of the Carboniferous Period, the Mississippian Epoch, much of North America was covered by warm, shallow seas. The many animals living in these waters contributed their shells to the formation of limestone. There were so many crinoids living in these waters that they make up a big part of the limestone formation. There were many bryozoans living in the shallow seas of the Carboniferous Period. Bryozoans are filter feeding animals that form colonies or attach to rock surfaces. Brachiopods covered the sea floor. These bi-valves look like clams, but are actually related to the bryozoans. Both are members of the phyla Lophophorata. The trilobite was less and less common during the early Carboniferous or Mississippian and was headed for extinction. The placoderms, or armored fish, that had ruled the Devonian seas, became extinct with the end of the Devonian period. They were replaced with fish that looked more like our modern fish. 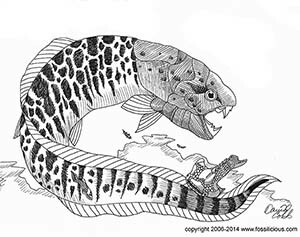 Many species of fish and sharks developed during the late Carboniferous. In the middle and late Carboniferous Period, the land was rising up out of the waters. Some of this was because of the land masses moving toward each other and pushing the land upward, but it was also because of the thickening of the Earth’s crust. Two ice sheets over the South Pole also took a large amount of water out of the oceans and the water cycle. More of the land was exposed to the air at this time. Both plants and animals had to adapt to the changing habitat. Short periods of drought brought on by the glaciers caused mass extinctions of the invertebrates that lived in the shallow seas. The shallow seas became swamps between the ocean and the dry land. New plants developed in the warm, humid climate and swampy conditions of this period. 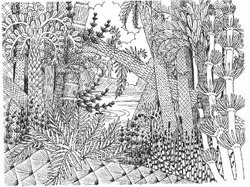 Large trees covered with bark and huge ferns grew in the middle Carboniferous swamps. The plants gave off so much oxygen that the air had much more oxygen in it. This allowed plants and animals to reach sizes that are not known in today’s atmosphere. When the huge trees and ferns died, they fell into waters that did not have bacteria to help them decompose. These plants formed peat beds. Eventually, with the weight of layers and layers, these peat beds turned to coal. See samples of Coal Shale Fern Fossils from the Pennsylvanian Epoch for sale. Land animals became more and more diverse as the land areas grew. Tetrapods were four-legged vertebrates that began to move onto the land in the late Devonian period. During the Carboniferous, more and more species of tetrapods evolved. Some were early amphibians that began their lives in the water and later moved onto land. Some were early reptiles that developed leathery skin as they moved to the parts of land that were very dry. These early reptiles also developed leathery coverings for their eggs so the insides didn’t dry out while the baby inside developed. Insects also grew well in the humid and high-oxygen conditions. One of the largest was the Meganeura. 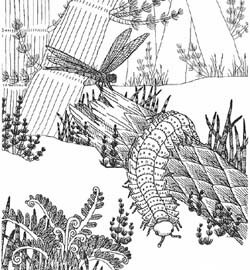 This large ancestor of the dragonfly had a wingspan of 60 to 75 cm. Another large arthropod lived on the floor of the Carboniferous forests. The Arthropleura was a giant millipede that could grow to more than one and a half meters long. They sometimes had as many as 30 pairs of legs! 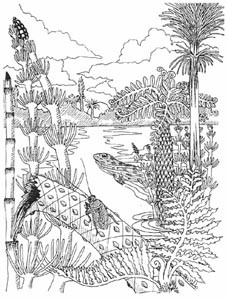 Below is a video of what it may have been like in the Carboniferous Period. It is taken from the BBC's Walking with Monsters, First Life, and Prehistoric Park. It is about 3 minutes long. Go to The Geologic Time Line.